Here is the background as to why I will blog about the new and wonderful adventure I am embarking upon in Yoga – incorporating the physicality and spirituality of yoga deeply into my life. And why am I doing this? Well – I had a proverbial “Brick-to-the-Head” Aha moment recently – actually, more than one! In June of 2010, I reached another personal “breaking point” – fed up with feeling constant pain and limitation in my body, and trying to deal with the phrase “give yourself time to heal”. I mean, after over 18 months since the accident , shouldn’t I feel better already?? (Can you hear the impatient Type-A raging within me in those words? 😉 My breaking point came after suffering a 4th grand mal seizure June 15th 2010 – and I was alone in my new home, about to take a bath. Again, I had no warning. I remember starting my bath water. I woke up 2.5 hours later, half naked on my bed, in extreme pain and very nauseous, with a bleeding and fat lip (bitten through), and bruises everywhere and possible broken ribs (which turned out was severe bruising, and bruising of the kidneys & liver). The water in my bath was still running and frigid – luckily I was not in it, and luckily the overflow took the water so my house was not flooded! Post-seizure, I fell deeply into grief and felt extremely sorry for myself. Then I got fed up with feeling so out of control and weepy and decided that I would take control of what I could in my life – my attitude.. In late June 2010, I tentatively stepped into my very first Yoga Studio (Breathing Space Yoga studio). I have done yoga over the years, in the form of classes at the local gym and through Yoga CD’s. But I had never been into a dedicated yoga studio before. It was life altering. Michelle subtly kept an eye on me during that entire yoga class. As a newbie, I hid in the back as far as I could, and did what I could – allowing myself to feel every moment as deeply as I could, reveling when I was able to touch my toes with less and less pain over the course of the 75 minute class, sweating litres of water out of my skin, slipping on the yoga mat, struggling with myself as I kept going. My back cracked and thunked – pieces locking back into place on their own for the first time in months! When we finally reached Shavasana (Corpse Pose) I was in heaven. I don’t know if it was the fact that the session was finally over, or the feeling of complete success and relaxation, but the emotional and physical high was profound. From that point on, I was hooked – to the physical release, the spiritual connection, and the mental strength I found within the practice. I feel so much better emotionally and physically and everyway, like I have unshackled limitations that were placed on me by others and myself, and I hadn’t even been aware of them. The physical limitations from the accident threw me, and my usual “push through the pain” attitude was detrimental, as I discovered the hard way. SO now I feel like I am back on track – clean eating, clean exercise and lifestyle plan again. And I am back on it fully, with a much better understanding of when to push through the pain, and when NOT to, and how to modify as necessary. Yoga is teaching me that – it is teaching me to accept the NOW, and where you are in that moment. Yoga is my primary focus, because that strengthens the muscles around the core/spine. That is critical for my entire health and my ability to recover from MS relapses and seizures. I look at how yoga has brought profound change to my life these past months – giving me back my ability to cope with the constant changes within my body due to my MS – from seizures to fatigue. It gave me back my confidence in my own ability to withstand the daily life challenges that we all face – by giving me the means to access my inner tranquility, my inner strength and peace, at any time I need it. It gave me back my physical confidence too – by giving me back my ability to stand strong and rooted to the earth, no longer afraid that I will be knocked to the ground by the slightest jostle. 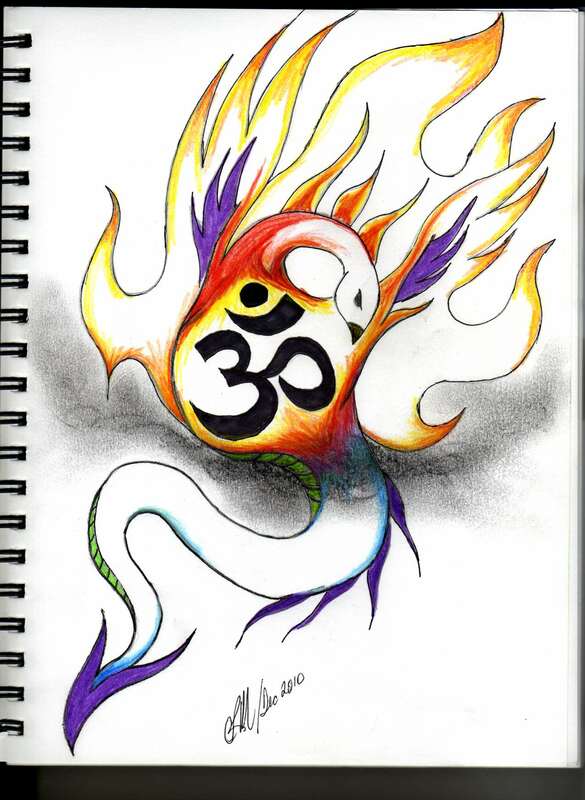 In that vein, I was inspired to tap into my artistic side once again and created a sketch depicting my own personal mythological yogic transformation, that of Dragon transforming through the Burn of yoga (Om) into a pheonix, rising from the ashes of its former life. I signed on for a new journey and lifestyle transformation – taking Yoga Teacher training in the fall of 2010 for nine months, in order to deepen my Yoga practice, learning all I can, and incorporating into my life deeply and completely, sharing with others as I can. The fears and struggles that I experience – no one should have to go through that without a resource to refer to. So I will take my struggles and turn them into a positive by sharing it out to the world again. If it helps only one person out there, that is good enough for me. Join me in my Blogging as my Inner Phoenix begins its journey through the ashes and flame back into the air! My graduation as a yoga teacher has opened up a whole new world to me. I feel confident in my own skin – confident that I can handle whatever life throws at me. I am happier, fitter, in much less pain, and much more balanced, spiritually, emotionally, and physically. I started my journey in the midst of a deep identity crisis. I was in deep pain, physically and emotionally, with MS pain, post-car accident injury and pain, seizure fears, emotional trauma and PTSD triggered by various events in my life, including the seizures. I can definitely say that the Post-traumatic Stress (PTSD) that I started out with has diminished greatly, if not disappeared. My ability to flow with the changes that come with a chronic illness has increased. I have learned to see and recognize truth and authenticity, and how to distance myself from toxic situations and toxic people. I am a new me… a stronger, more resilient, and much more flexible ME! And the journey into my yoga transformation continues!